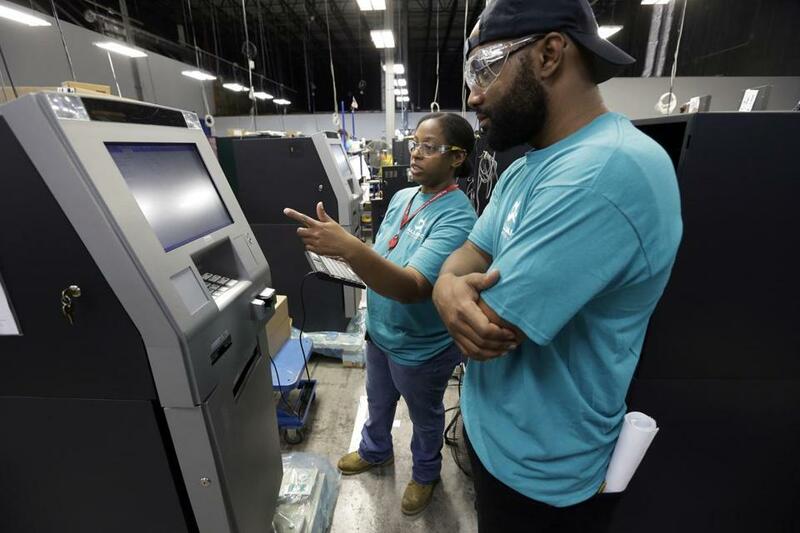 Diebold Nixdorf employees Stephen Cheek and Lashanda Mitchell checked out ATMs at the firm’s factory. NEW YORK — An automated teller machine. The cash machine. In Britain, a cashpoint. ATMs, known for spitting out $20 bills (and imposing fees if you pick the wrong one), turn 50 years old this year. They’re ubiquitous — and possibly still a necessity, despite the big changes in how people pay for things. It was a radical move when Barclays installed cash machines in a London suburb in 1967. The utilitarian machine gave fixed amounts of money, using special vouchers — the magnetic-striped ATM card hadn’t been invented yet. There was no way for a customer to transfer money between accounts, and bank employees tabulated the transactions manually at the end of each day. ‘‘The ATM tapped into that innate force in people that gives gratification for doing a task on their own and it grew from there,’’ said Charles Kane, a professor at the MIT Sloan School of Management. It was a radical concept at the time. The ATM wasn’t the first self-service device — vending machines and the automat had been popular before. But those dispensed items people could hold in their hand. Bernardo Batiz-Lazo, a business professor and ATM historian at Bangor University in Britain, said early users of automated tellers were often checking their balances twice: once to see how much was in their account, then again after withdrawing money to see if it registered. ‘‘They were popular, but it took a long time to slowly convince customers to learn about ATMs and use them regularly,’’ Batiz-Lazo said. Around the United States today are roughly 3 million cash machines, according to the ATM Industry Association. The wide acceptance of the ATMs changed the types of cash Americans typically carry in their pocketbooks. Since ATMs became more widely available in the early 1980s, the twenty-dollar bill has regularly been the second-most printed bank note each year by the Bureau of Engraving and Printing. The first place spot is held by the $1 bill. Newer ATMs have more functions than ever. They accept check deposits, can transfer money between accounts, show an account balance, pay a credit card or mortgage payment, or even sell you stamps.